I've got a quick recipe for you today as I am behind the scenes working on the blog this week. 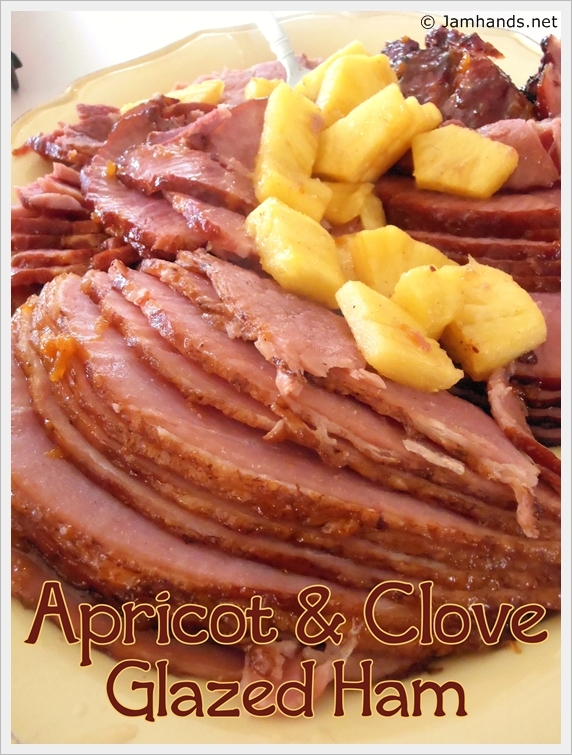 Apricot and Clove Glazed Ham is delicious and perfect for a special meal on Easter or Christmas, or for that matter year round as it is super simple to make. As seen in the picture we baked it with fresh cut pineapple (not canned!). My only word is advice is to please not use those water packed hams that are cheap and flavorless. Get the good stuff! 1. Mix the preserves and cloves together until well combined. (Taste for seasoning at this point to see if you want it to have a stronger clove flavor). Brush over ham as it cooks, following the instructions for cooking as directed on the package of the ham. Yum... I adore the combination of ham and cloves! Hollie - I agree! It is a really delicious combination.